The window for life to take root across broad stretches of the Martian surface may have closed shortly after the first microbes evolved on Earth. New results from NASA's MAVEN spacecraft suggest that the Red Planet lost most of its carbon dioxide-dominated atmosphere — which had kept Mars relatively warm and allowed the planet to support liquid surface water — to space about 3.7 billion years ago. But this finding doesn't rule out ancient Mars as an abode for life, he stressed. After all, scientists know that Earth supported life by 3.8 billion years ago, and a recent study suggests that microbes may even have existed on Earth as early as 4.1 billion years ago. "Mars appears to have had a more clement environment for just as long as it took life to form on Earth," Jakosky said. "That doesn't tell us that life did form on Mars, but it says it's very plausible. It's at least not a stupid idea to ask whether it did." Mars is cold and dry today (albeit with scattered areas of seasonal water flow), but things were very different in the ancient past. Observations by NASA's Mars rover Curiosity and other spacecraft have shown that the Red Planet was relatively warm billions of years ago, with extensive lake-and-stream systems and perhaps even a large ocean that covered much of the Martian surface. The planet's dramatic transition is tied to the loss of its atmosphere, which is now just 1 percent as dense as that of Earth at sea level. Scientists have long wondered what exactly happened to Mars' air, and that's where the $671 million MAVEN mission comes in. Since November 2014, MAVEN (whose name is short for Mars Atmosphere and Volatile Evolution) has been characterizing the Red Planet's upper atmosphere from orbit and measuring how fast Martian air is leaking into space, among other duties. The probe's observations should help scientists better understand the planet's climate history and its past potential to host life, NASA officials have said. A better understanding is indeed now starting to emerge, as demonstrated by a series of new MAVEN studies that were published online today (Nov. 5) in the journal Science. For example, one of these studies suggests that long-ago solar eruptions played a large role in stripping away the Red Planet's air. Such solar storms were stronger and more frequent about 4 billion years ago, and the sun's emissions in extreme ultraviolet (UV) light were more powerful back then as well, he added. 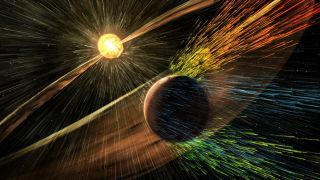 The solar wind — the flow of charged particles from the sun, which is a major driver of Martian atmosphere loss today — was also more potent during the sun's youth. "All of these [factors] point to the loss of the Martian atmosphere in the earliest stages," Jakosky said. That stripping would then have proceeded very quickly, "within a few hundred million years after the shutoff of the magnetic field," Jakosky said. The other, related papers published today in Science shed new light on the composition of Mars' upper atmosphere; provide new details about the Red Planet's intriguing, diffuse auroras, which are similar in some ways to the gorgeous northern lights displays seen on Earth; and report the detection of dust that appears to be interplanetary in origin. Map of the Martian auroras detected by NASA's MAVEN probe in December 2014. The aurora was widespread in the Red Planet's northern hemisphere. "It's not something we expected," Jakosky said of the Martian auroras, whose detection the team first announced this past March at the 46th Lunar and Planetary Science Conference in Texas. "It tells us that solar particles are streaming directly into the Mars atmosphere, where they can have an impact." MAVEN spotted the auroras in December 2014 using its Imaging Ultraviolet Spectrograph instrument, which, as its name suggests, is sensitive to UV light. "We know that the same processes that create UV emissions on Mars will create visible emissions that would appear green, red or blue to the eye — if bright enough," study lead author Nick Schneider, also of LASP, told Space.com via email. "We think that this event probably wasn't bright enough, but suspect that other events could be. So maybe if you had as much time on Mars as Matt Damon, you might see it!" MAVEN's observations also show that these diffuse auroras can happen anywhere on the planet, Schneider added (unlike Earth's displays, which are generally restricted to high latitudes). "Our observations show unambiguously that a planet with no global magnetic field can [be] exposed to the full force of the solar wind and solar storms," he said. "Mars' atmosphere took a beating." The dust, which MAVEN observed at altitudes ranging from 124 miles to 621 miles (150 to 1,000 kilometers), also came as a surprise, Jakosky said. "We're getting hit by thousands of grains of dust," he said. "We think that this is dust coming from outside the Mars system." The detection by itself "is an interesting oddity," he added. "But [the dust] would also be the source of a steady-state metal-ion layer in the ionosphere that we've detected as well. That's another discovery from MAVEN. It's something that has the ability to affect the chemistry and energetics of the upper atmosphere. We still haven't worked through the implications, but it's something that's a really important observation." These findings provide just a taste of what MAVEN has been doing in Mars orbit for the past year. The mission team also published 44 (yes, 44!) studies online today in the journal Geophysical Research Letters. "It's incredibly satisfying to get to this point and realize that we really are answering the questions we set out to when we started the mission," Jakosky said. "We're beginning to understand what drives climate change on Mars, and to try to generalize to planets more generally."